A van which smashed through a central reservation, killing five people, had 18-year-old tyres, an inquest has heard. The converted horsebox veered off course when its front tyre burst just before the fatal smash on the M5 in September 2017. Avon Coroner's Court was told it had passed an MOT but been issued with an advisory about the tyre's condition. The driver told the hearing he did not know about the notice. 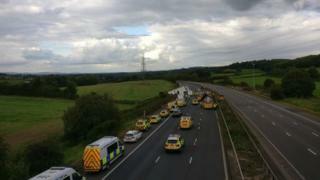 The van hit two vehicles when it crossed into the opposite lane of the the motorway at junction 14. Mr Beaumont's partner, Rebecca Mitchell, 42, died at Southmead Hospital seven months later. Accident investigator David Price told the inquest he concluded the front offside tyre had burst, causing the van to veer "very sharply across the motorway". "It deflated instantly and in doing so, it would have caused a strong pull to the right." He added the tread on the "extremely old" tyre had separated and said the tyre's age was a "principal cause" of deflation. "I was absolutely astonished that someone hadn't checked the tyre pressure for a year," he told the hearing. "I have never heard of someone being so careless about maintenance." The van's tyre had defects including cuts to the tread area, not caused in the collision, as well as micro-cracks. Vehicle examiner Gary Ford, from the Driver and Vehicle Standards Agency (DVSA), said he "did not believe" the van's driver, Michael Bakewell would have noticed these defects during a regular check. The inquest was told Mr Bakewell's father took the van for an MOT in March 2017, and the advisory notice relating to the condition of the offside front tyre had been given. "All I knew was that it passed," Mr Bakewell said. "I didn't know about that (the advisory) until yesterday. If I had known about the MOT, the tyre would have probably been changed or had a very good examination." Mr Bakewell acknowledged the tyres were about 18 years old at the time of the collision. "If I had known the age they would have been replaced," he added. "If I had noticed (the cracking) I wouldn't have driven it." On the day of the crash, he and his wife set off for Tiverton, Devon, and before driving Mr Bakewell said he conducted a visual inspection of the tyres. Describing the moments before the smash, he said: "There was a loud bang. Within seconds it veered dramatically to the right. "I would do anything I could to preserve my own and other's lives."